Critically acclaimed singers Barbara Kilduff (soprano) and Gerald Seminatore (tenor) will join their voices for two performances of “Tears of Gold,” a recital of Spanish, French, and English songs and duets. Brian Moll will partner with them at the piano. This program offers a unique opportunity to hear world class performers in a live concert of classic songs for solo and duo voices, along with some favorites you may recognize. General admission, tickets available at the door (no advance sales). $15 / $10 students, seniors. We are nowhere near the windmills of the Moulin Rough in Paris. 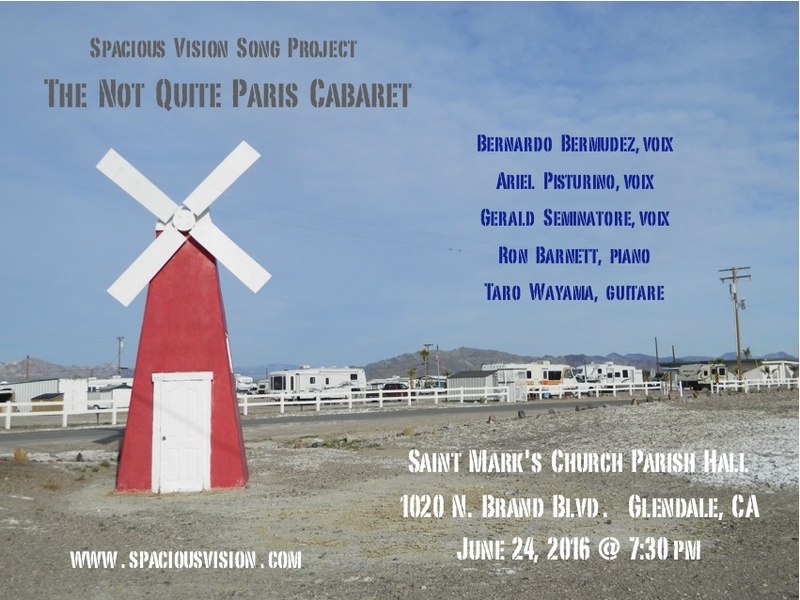 However, we will sing a song about them, and also offer many other classic European and American selections during the “Not Quite Paris Cabaret.” In recognition of the support offered to Spacious Vision by the Worship Arts ministry at St. Mark’s, this concert will benefit the church’s partner congregation and school in Haiti. Table seating, cash bar with light refreshments. There is ample (free) street parking in front of the church, or in the lot behind the church off Dryden Avenue. The Parish Hall is wheelchair and walker friendly. American born lyric baritone BERNARDO BERMUDEZ started his musical education at The Conservatory of Music Juan Manuel Olivares in Caracas, Venezuela. His many operatic credits include Figaro in Il barbiere di Siviglia, Silvio in Pagliacci, Stanley Kowalski in A Streetcar Named Desire, Belcore in L’elisir d’amore, Papageno in Die Zauberflöte, Count Almaviva in Le nozze di Figaro, Vidal in Luisa Fernanda, Schicchi in Gianni Schicchi, and Morald in the North America stage premiere of Richard Wagner’s Die Feen, as part of Los Angeles Opera’s Ring Festival. Bernardo was a voice fellow at both The Music Academy of the West in Santa Barbara California and Opera North in New Hampshire. His singing has been recognized with awards from the the Burbank Philharmonic Hennings-Fischer Opera Competition, the Opera Buffs, and the Loren L. Zachary Vocal Competition. Soprano ARIEL PISTURINO completed her graduate studies at the University of Southern California, where she performed with the Thornton Opera. She has appeared with the Long Beach Opera and other Southern California companies in roles from Carmen, Don Giovanni, Nixon in China, and The Magic Flute. Most recently, Ariel appeared in the nationally acclaimed operatic event Hopscotch with the Los Angeles-based company The Industry, and as Donna Elvira in Don Giovanni with the Redlands Opera Theater. 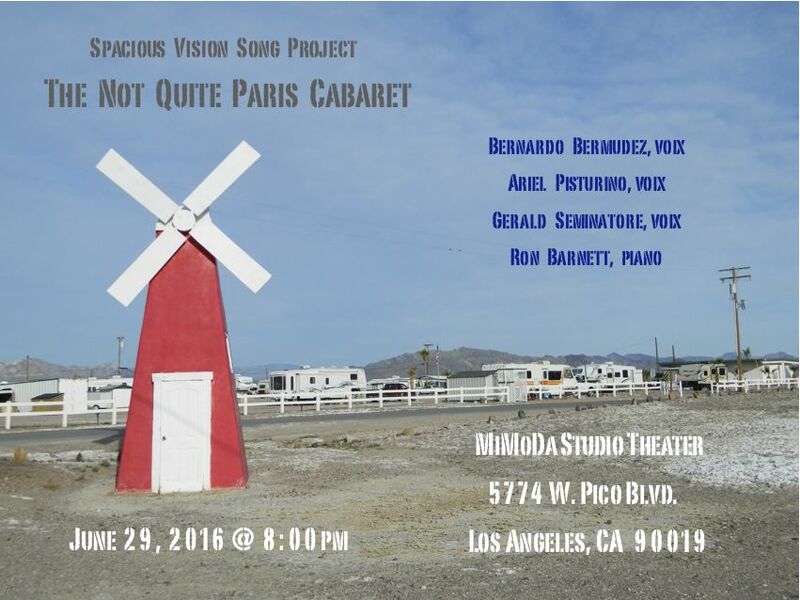 Ariel is a co-founder of the Chamber Opera Players of Los Angeles (COPOLA), and a frequent collaborator in performances of new works. She was a featured soloist on the recent Delos Records releases of “Terrain of the Heart” and the opera “Home is a Harbor” by composer Mark Abel. 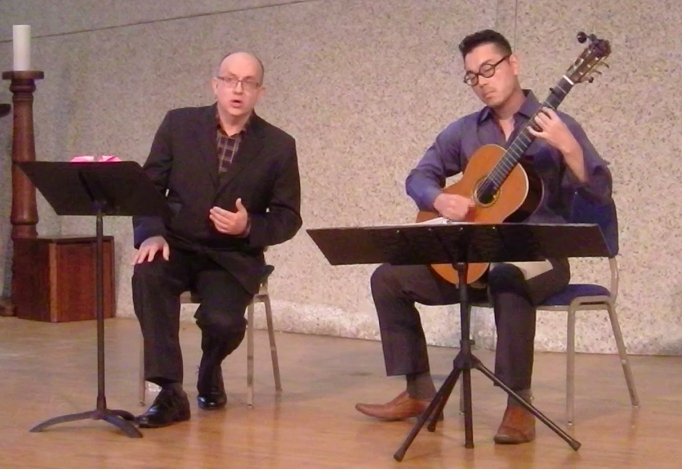 Selections from “Love’s Guitar” with Taro Wayama (guitarist) and Gerald Seminatore (tenor). Songs by Benjamin Britten, Claudio Monteverdi, and Joaquin Rodrigo, with additional solo selections played by Taro and guitarist Thomas Foster. General admission. $15 donation requested, pay what you can.